In a very unusual development, Apple’s new iPhone 5C plastic smartphone is already being discounted at major retailers. Best Buy sent out an e-mail a short while ago offering a $50 discount on the purchase and two-year activation of the new iPhone 5C (16GB model) bringing down the price of the “cheaper” plastic smartphone to $49.99. The $50 discount is in the form of a Best Buy gift card. I can’t think of a previous occasion when a new iPhone has been discounted so early in its life-cycle. Apple launched the iPhone 5s and iPhone 5C a fortnight ago on September 20, 2013 in the U.S. and several other countries. 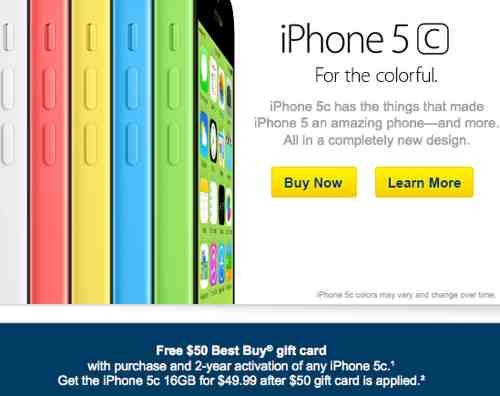 Best Buy’s $50 discount on the iPhone 5C is valid from October 3-7. The discount is valid for both online and in-store purchases. For online purchases, the gift card can be used only on a future purchase. Customers buying the iPhone 5C at a Best Buy store can get the $50 discount immediately and apply it to the purchase of the smartphone. The discount on the iPhone 5C has led to an odd situation where the older iPhone 5 ($99 with two-year contract) is now costlier than the newer iPhone 5C. The easy availability of the iPhone 5C and the widespread shortage of iPhone 5s at major stores in the U.S. (including at the Apple stores) suggests Apple may have miscalculated demand for both smartphones – Overestimated demand for the iPhone 5C and underestimated demand for the iPhone 5s. I won’t be surprised if excess inventory of the iPhone 5C leads to those smartphones soon being offered free with two-year contracts. iPhone 5C is available in five colors – Green, blue, pink, yellow and white.